The apartment, with stunning views, is built in the grounds of our house. It has an open plan livingroom and kitchen and one bedroom ( with kingsize double bed) and bathroom with bath and shower. 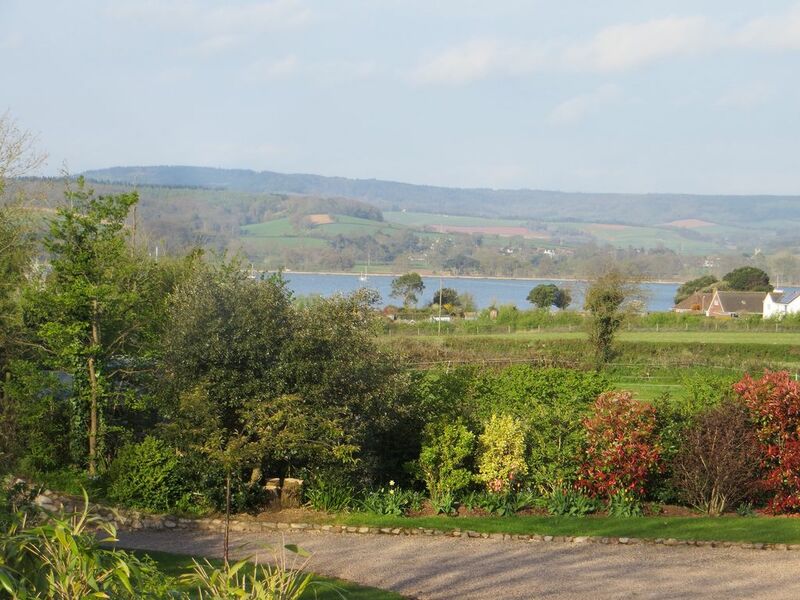 It is a 10 minute walk to the lovely village of Lympstone with store, coffee shop and 3 pubs/ restaurants. There is a train station on the Exmouth to Exeter line. The cycle path along the estuary is lovely for walking or cycling. Exmouth Beach is only 10 minutes away. We are David, retired chartered civil engineer and Ali, Dutch and retired teacher and moved to Devon in 2009. After living and working abroad for many years, we lived in Hampshire for 25 years. David always wanted to retire to Devon and it has been an excellent decision. We built a beautiful new house in 2011 and enjoying life here with golf, gardening, tennis etc. It is so peaceful here with stunning views and sunsets over the estuary. There are several footpaths to the village and we regularly stroll to the village for a drink or a bite to eat. Separate bathroom with bath/shower over, wc and basin. Living room/ kitchen with solid oak floor, modern 3 seater leather sofa and matching leather chair. Dining table. Television with freeview channels and DVD player. Kitchen area with electric cooker, fridge with freezer compartment, toaster, kettle etc. East Devon Golf Course in Budleigh Salterton and Woodbury Park Golf Course are 10 or 15 minutes drive away. Notes on accommodation: Please note: no children, pets or smokers. Free internet. Outside: There is a small patio area with seating. Cleaning / Towels / Linen / Maid service: Bed linen and towels provided. Well equipped and generally excellent flat near to the Exe and pleasant village of Lympstone with it's pubs and general store. Great base for the South West coast path and all the local resorts and attractions. Tranquil sunny flat with a beautiful view and everything you need for self catering. Very relaxing place to stay, warm and tranquil. A great base for exploring the local bits of South Devon. Endless things to do and walks to take. beautiful one bed apartment with stunning views, a lovely quiet location. Fantastic one bed apartment located a short walk from the village centre. Although located a short distance along a bridle path there is plenty of parking. Everything you need for your stay is provided, kitchen has fridge with small ice box, kettle/toaster/microwave...full oven if you fancy cooking although there are plenty of local pubs for main meals out. The bathroom has a good shower and the bed is very comfortable, home from home and we will certainly be returning. David and Ali are very nice and helpful. The flat was just right for our week. There is a footpath a few feet away from the property and we were able to walk into Lympstone and join the coastal path. Dartmoor is not far away we had a lovely day driving around and also went Paignton zoo. Well appointed apartment, ideal location for not using the car. Cycle route close by and plenty of walking. Local station about 10 mins away with connections to Exeter and Exmouth. Very quiet, and glorious views across River Exe especially at sunset. A very warm welcome from the owners, will certainly consider another visit. Look forward to seeing you again ! Super apartment and location. David and Ali were very helpful. Exmouth has a beautiful sandy beach and is 10 minutes drive away. Booking Notes: A 20% deposit is required at the time of booking and the outstanding amount 6 weeks before your holiday. Changeover Day: Change over day is flexible.